Last week, the College reported a total of 22,005 applications for the Class of 2022, marking a 9.8 percent increase in applications compared to last year. Applications for the Class of 2021 totaled 20,034. Co-founder of college admissions consulting firm Top Tier Admissions Mimi Doe said she had several theories that could explain the increase in applicants. Working with students around the world, she noticed that Dartmouth was ramping up its efforts to recruit more first-generation, low-income students, especially through pipeline organizations like QuestBridge, she said. Doe added that an “overwhelming recognition” of the higher chances of getting accepted by applying early decision may have also influenced students to apply to the College in greater numbers. Doe said the increase in applications would make the College “more competitive” and added that she predicts Dartmouth’s admission rate will decrease. “I anticipate a single-digit acceptance rate overall,” she said. Last year’s acceptance rate was 10.4 percent. Bev Taylor, founder and chief executive officer of college admissions consulting firm Ivy Coach, said this year’s numbers represent the biggest spike in total applications received since 2015. She said she noticed that more international students are applying to college with Dartmouth in mind. 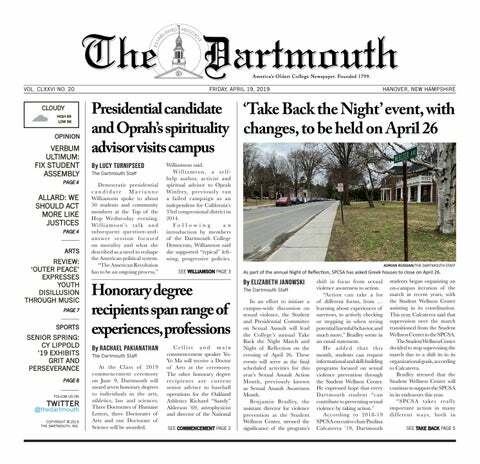 “It seems to me that the trend at Dartmouth under [vice provost for enrollment and dean of admissions and financial aid] Lee Coffin is more early decision and regular decision applications, lower admission rates and a higher overall enrollment,” Taylor said. She added that Coffin had attributed these facts to the College’s new communications plan, publicly announced on Jan. 21, in which the College worked to increase Dartmouth’s publicity, especially promoting its focus on undergraduate teaching and research opportunities available for students that may not necessarily be available at other universities. Like Doe, Taylor said that the College is also increasing outreach to more students of “low socioeconomic backgrounds,” which leads to more applications. Doe added that the College would most likely avoid a housing crisis by reducing the number of students accepted through regular decision, since nearly half the class has been filled through early decision already. This, she said, would also make admissions to the College more competitive and reduce the overall admission rate. Marco Vargas, a prospective student from South Los Angeles, California who applied via the regular decision process, said it was “honestly scary” but that he felt fortunate because he had help applying from College Match, a program designed to help first-generation, low-income students get into top-tier colleges. Vargas said he had help preparing for his interview, which helped him feel ready for it the day it arrived. He added that he had fun talking to a College alumnus, who made him feel welcome and spoke with him for about an hour. Ali Safieddine, a prospective student from Henderson, Nevada who also applied regular decision, said the overall process for him was understandable and easy but still left him trying to figure out how to revise his essays because his school did not offer college advising. He said things turned out fine nonetheless and that he was happy with his interview because he was able to ask his interviewer all his questions about the College. Both Safieddine and Vargas said they enjoyed the “Why Dartmouth?” prompt on the College’s admission application. Vargas said the prompt allowed him to express his passions and see how they would be best served on campus. “The way it was phrased allowed me to just think critically about what I really would gain from Dartmouth,” he said. Safieddine added that the 100-word limit made it “challenging” and forced him to get to the point. Despite this, Safieddine said that as a first-generation student without advisers, navigating through the essays and applications was tricky because he did not have all the information he needed on time. Early decision admits totaled 565 students for the Class of 2022, from a record-high pool of 2,270 students who applied through the early decision process. Regular decision applicants must wait until March 28 before hearing back from the College. Correction Appended (Feb. 6, 2018): An earlier version of this article misspelled Ali Safieddine's name. The article has been updated to correct this error.